Oh no! There are bad things happening! On a small college campus, co-eds are being stalked and killed by a masked murderer who carries a cleaver. With each murder, the killer chops off a limb and carries it off with him. He also leaves behind a mysterious gold medallion, one that appears to feature an etching of a dog on it. It’s a bit of a mess, really. Early on, in the 1985 film, Blood Cult, a narrative crawl informs us that the events that we’re watching occurred during the previous winter. These murders, we’re told, were “the strangest crimes in recent recorded history.” The film opens with one of those crimes. In an homage to Psycho and every other slasher movie ever made, the first murder occurs in a shower. The showering victim looks straight at the camera during her scenes. When she delivers her lines (“Is that you? Did you get the pizza? Did you get my anchovies?”), she does so in a flat, Oklahoma accent. In short, these scenes proudly announce that we are watching an amateur, regional production. Anyway, the film itself deals with Sheriff Ron Wilbois (Charles Ellis), who must solve the murders before they harm his chances of being elected to the U.S. Senate. Fortunately, he has some help from his daughter, Tina (Judi Adelman). Tina is a librarian, which means that she has magical research powers. All she has to do is open up a book and, thirty seconds later, she will have discovered whatever needs to have been discovered. Unfortunately, Tina may have some secrets of her own. She’s also dating an rather dorky guy named Joel (James Vance). Joel is the type of guy who, when he meets his girlfriend’s father in a diner, lazily props his feet up in the seat across from him. I mean, come on, Joel! At least try to impress the old man! I kept expecting Sheriff Wilbois to yell, “Get the Hell away from my daughter!” and maybe draw his gun but apparently, that was not the Sheriff’s style. The Sheriff’s a good, honest lawman. He’s not the type to abuse his powers. He just wants to solve the murders, go to the Senate, and drink a lot of Coke. Seriously, there are so many Coke cans in this movie that, if not for the film’s amateur status, one could be forgiven for assuming that the film was produced by the Coca-Cola Corporation. Can you spot the Coke? There’s a twist to Blood Cult but it’s not a particularly surprising one. In fact, there’s really nothing surprising about Blood Cult. Some of the gore effects are effective in a low-budget way. One victims gets beaten to death by another victim’s severed head. That was kind of creative. For the most part, though, Blood Cult never escapes the constraints of its low budget and its status as an amateur production. I did feel that Charles Ellis, who was a regional theater actor, gave a fairly good performance as Sheriff Wilbois. He came across like being a genuinely nice guy. I would have voted for him. The rest of the cast was forgettable at best and painfully stiff at worst. 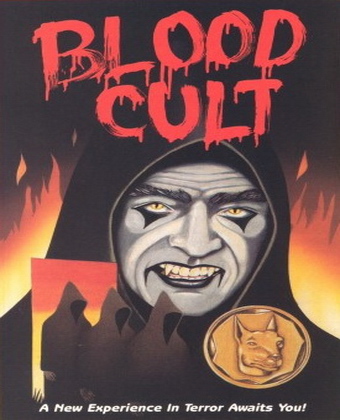 Blood Cult is historically significant because it was actually the first movie to ever specifically be made for the home video market. Every straight to video movie ever made is a descendant of Blood Cult. Apparently, it was filmed in nine days, with the cast and crew taking a week off from their days jobs. To the film’s credit, there are a few atmospheric scenes, largely because Oklahoma is a naturally atmospheric state. 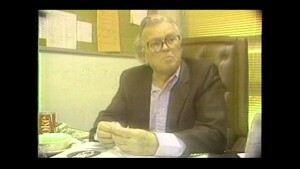 But, for the most part, Blood Cult has a “Grandpa Picked Up a Video Camera And Made A Horror Film” look and feel to it. I have a weakness for amateur, regional horror movies and the DVD of Blood Cult comes with a likable director’s commentary but, for the most part, this is a film that’s significant mostly as a piece of historical trivia. I have to agree that there is a definite odd appeal to these no budget regional productions. You have to admire the enthusiasm and determination if nothing else. I would assume this actually made a profit somewhere since they ponied up the money to hire John Wayne’s son to headline the sequel, REVENGE.